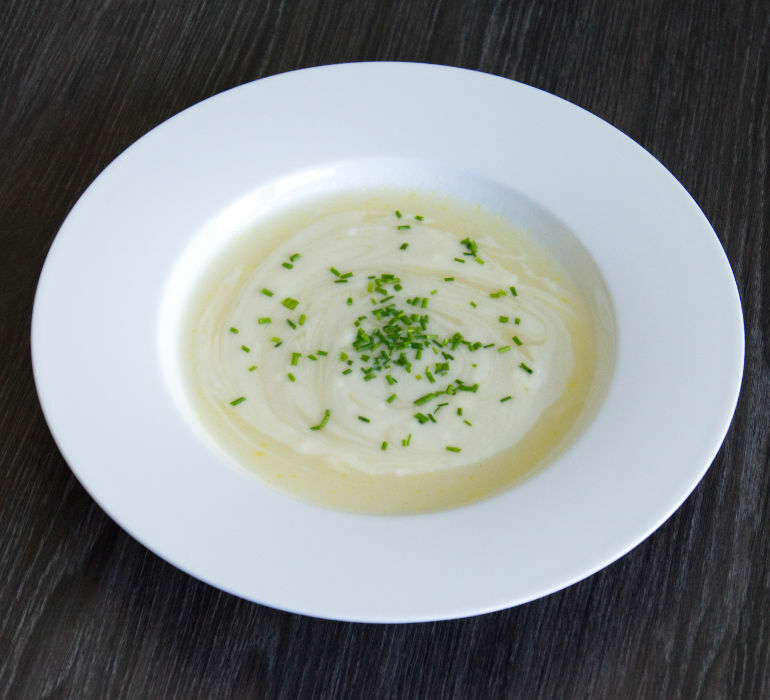 Traditional German Creamy White Asparagus Soup makes a perfect starter for any meal! The soup is exceptionally delicious and has a very light taste. Along with cream blob and fresh chives, it’s one of the most popular dishes in the white asparagus season. The soup base is asparagus broth (water in which you cooked the white asparagus) and white roux which gives the soup creamy, rich texture. Take large pot (where you can put all the liquid), melt butter on medium heat. Add flour and stir vigorously while it bubbles. Cook for about 5 minutes over medium heat. Turn heat to low and add a little bit of the white asparagus stock very slowly. While adding the white asparagus stock continue stirring. As soon as you have added more the 1/3 of the white asparagus stock, you can pour the rest of it inside the pan and wait unill the soup start cooking. Make sure you stir the soup every 1-2- minutes. Season the soup with salt and pepper. You can add sugar and wine, if you would like to. Place 1 tablespoon white asparagus cubes in the bowl and pour 200-300ml soup over it. Serve hot. Garnish with whipped cream and chives. You can keep the soup in the fridge for 2 days or freeze it.